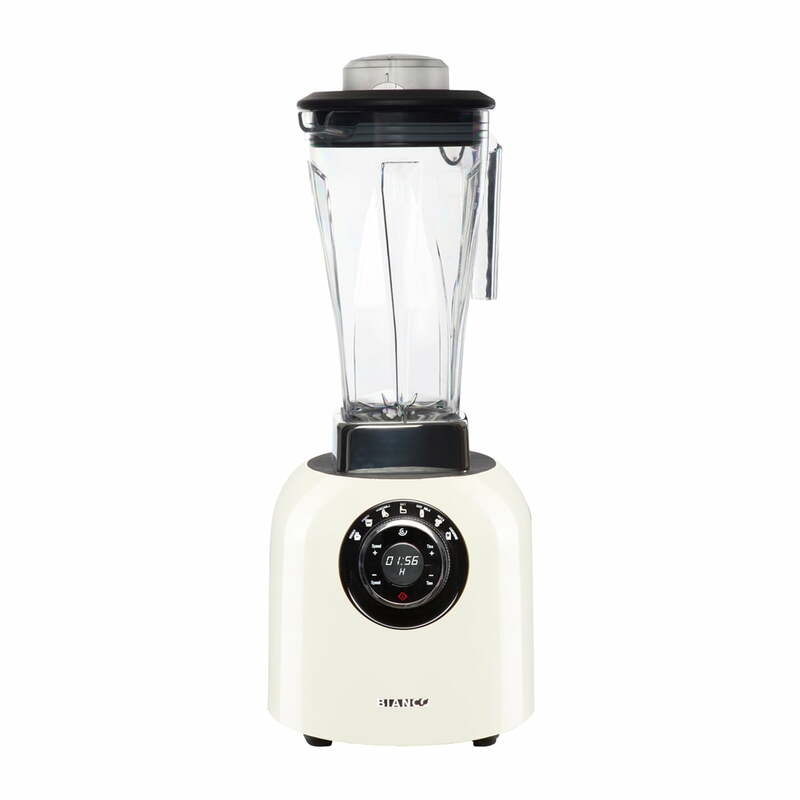 The Bianco Puro is a blender, which doesn’t only win you over in regard to its design, but above all in regard to its high mixing power and special functions in the kitchen. Foods: even avocado pits, can be crushed with the powerful 2 HP motor, 1680 watts performance as well as 6 stainless steel blades which release almost 100% of the trace elements and minerals. The Bianco Puro mixer can be adjusted to work between 14,000 and 32,000 revolutions per minute depending on the foods' size and hardness. 6 automatic programmes make using it easier. Runtime and speed can be adjusted by the user in manual mode for individual use. 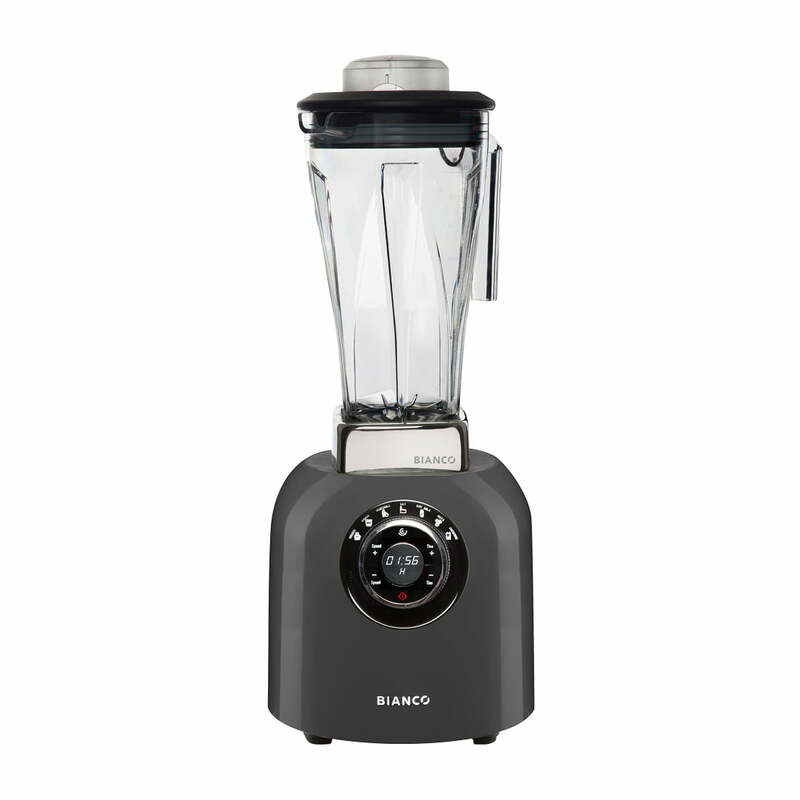 The Puro blender also has a pulse-button with which the mixer is able to immediately run at the highest level (32,000 revolutions per minute) with only one push of a button. An additional highlight is the patented Bianco T42L Tamper, which is able to measure the food temperature while you’re preparing it. Ideal for the careful preparation of raw foods soups and other recipes. You can not only mix smoothies and juices with the Bianco Puro soups, dips and sauces too are child’s play to make yourself thanks to the different programme settings. The Bianco Puro is protected from overheating thanks to a fitted temperature control. If it is stressed with too solid food and too few liquids, the mixer should cool down for about 45 minutes in a well ventilated place, after that the Bianco Place can be used again as normal. The mixing jug sensor detects when this is not correctly set up. Should the mixing jug not sit correctly on the motor, it is impossible to switch on the mixer. The risk of the Bianco Puro mixer being damaged by incorrect use is thus eliminated. 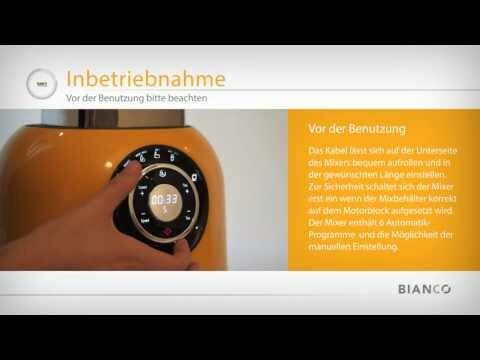 The Puro blender by Bianco is again clearly demonstrated with all its features and benefits. Using separate programmes and recipe ideas are shown in detail here, for you to copy. The Puro blender proves its skills.